Lord & Berry; one of those brands that has eluded my makeup stash for a good while now, but has always been highly sought but out of reach. As an avid swatcher, I do like to get a good feel for products before I part with my hard earned cash, and this has held me back from investing in L&B as I've never been able to hold them in my own hands, experiment with the colours and just get a feel for the brand as a whole. 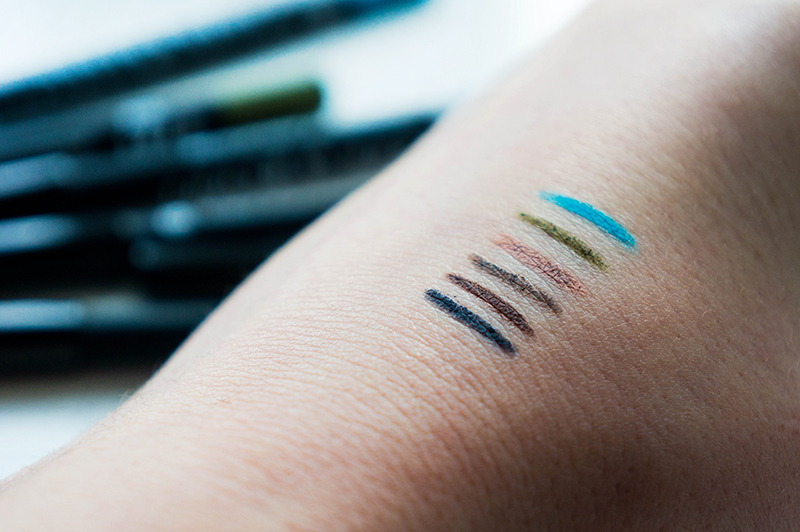 However, Pure PR very kindly sent me a handful of the new Smudgeproof Eyeliners to trail and I was over the moon! I've become a little obsessed with eyeliner recently, but only sticking to the more conventional colours (or should I say 'lack of'), this was the perfect opportunity to experiment. 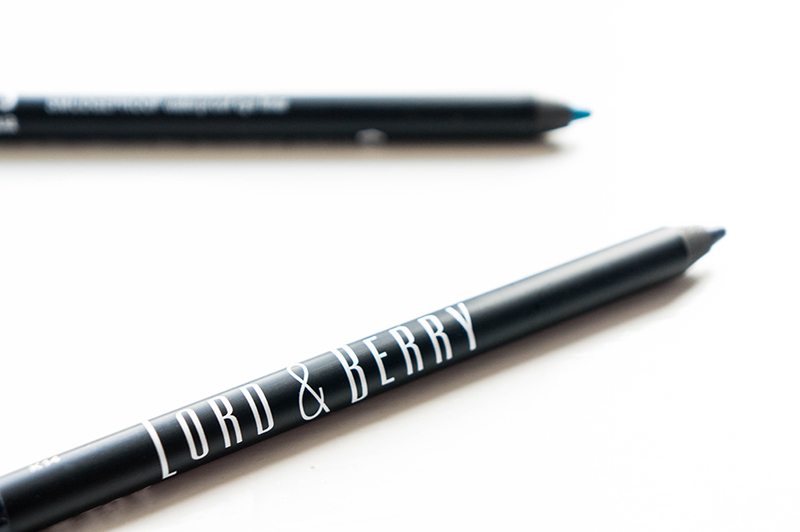 Lord & Berry have certainly created a product that stands the test of time, and in such versatile shades with an easy to use pencil. A deft hand and a few minutes are all you need to create a rich accent to any defined eye, and I can't attest enough how well these last. On the eyes, it takes a good amount of makeup remover before these even begin to budge, so you can imagine my sheer joy when I'd left swatches on my hand while I went about my day running errands and doing chores, and they were still there, clear as day at the end of the night! Getting this stuff wet doesn't cause it to run, there's just no smudging this stuff. Something to bear in mind if you're going for that smokey eye look, as you've got about 30 seconds before it sets and you'll have to try your best with makeup remover. There's a reason it's touted to last 24 hours, ideal for the party-goer in all of us. I can see this being the perfect accompaniment to a workout at the gym (post Christmas) and even better for long nights and early mornings. Applying is so simple as there's no catching on the skin, it glides so smoothly, unlike most pencil eyeliners I've tried previously. 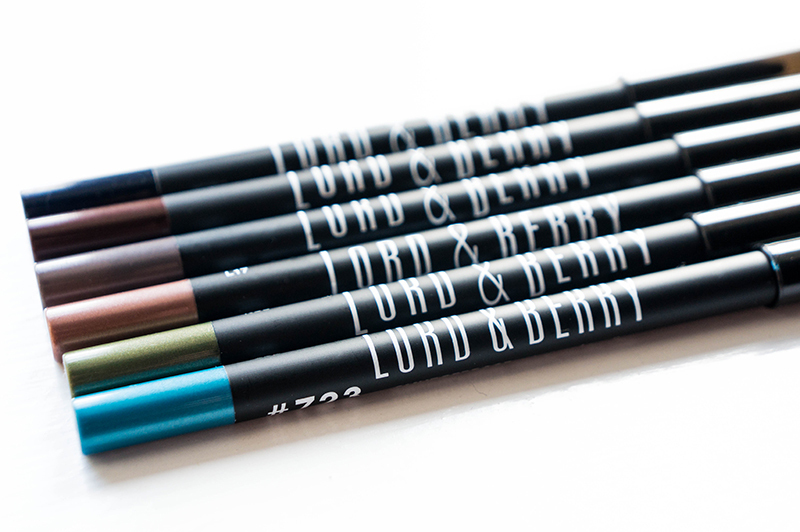 Lord & Berry Smudgeproof Eyeliner comes in nine intensely rich and pigmented shades, of which I've used; Ocean, a gloriously deep blue-purple that I can see adding something extra to your traditional winged liner look. Bronze, a matte mahogany brown that will be perfect with just a slick of mascara. Smoke, an intense gunmetal grey that could prove seriously addictive with a silver smoky eyes look. Sand, a metallic copper colour that could easily be used as an all over eye shade and smudged out for simplicity. Oliva, Khaki green that's screaming out for a good bit of lower lash defining. And lastly Aqua, the brightest of the bunch with a metallic sheen that will be a staple during the summer months. The best thing about Lord & Berry? They're launching their range of cosmetics into key NEXT stores this month! That means you could pick up your own Smudgeproof Eyeliners in London, Manchester, Birmingham, Newcastle, Edinburgh, Essex, Oxford, York, Liverpool and Cardiff. Seeing Oxford on the list made me cry in delight, as I'll probably spend all my lunch breaks lusting over the gorgeous products that I'm now well and truly hooked on. Have you tried Lord & Berry? These look like beautiful colours I am glad they are long wearing! They truly don't budge unless you want them too, amazing! I would like to get my hands on a black one for a smokey eye for my darker coloured eyeshadows. Did you give any of them a shot? I was surprised, as I've never been a big pencil liner fan. I've been converted! These look amazing ! I have a lip crayon from them and its amazing ! I haven't tried their products or heard too much about them but I'm definitely going to keep my eyes out for them! I fell in love with their packaging before I even really took note of how awesome their products were. I need to pop in and see just what they stock in there now it's truly launched. But the colors are so pretty and vibrant! I love how much they have in terms of colour range for liner. Most places only do black or brown as standard. The quality and the pigmentation seems amazing ! I would love to get a lip liner that's the same. It is! I'm always so cautious ordering makeup online unless I know what the colour is going to be like. Where's your nearest NEXT that stocks them, Becky?